I'm at the CIPD HRD Conference at Olympia today (Wednesday 24th April), and having been very busy at work in the last few weeks, I have been neglecting my social and professional networks. Come the weekends, I've found my brain so full of work-related 'stuff' that I've either not logged into Twitter and LinkedIn or have done so - and facebook - but just engaged in some personal comments and light banter. This has thrown up some interesting perspectives for me, particularly in relation to my 'professional' profile and my 'personal' profile and interactions, and where humour sits between or across those domains. Combined with seeing some 'humorous' tweets about some of the Conference topics already today, it has raised questions for me of authenticity, appropriateness and self-censorship. I am someone who is passionate about wit and wordplay. The essence of a 'joke' is the element of surprise - that's what makes us laugh; and I love it when someone does precisely that - ambushes me with the unexpected - and I find myself helpless with laughter as a result. My long-standing 'Hero of Comedy' is the genius who was Eric Morecombe. I find myself almost incapable of articulating the exquisite agony of watching him and Ernie Wise in the endless re-runs of their television programmes (but I'll have a go). I am in a conflicted state of joy and sadness when I watch them, torn between total love and enjoyment of their wit and humour and the still palpable sense of loss that they are no longer with us. I literally watch Eric and Ernie with tears in my eyes - of both laughter and sadness - and I know this is inextricably tied to the passing of my Father - on which I have previously blogged - "Age Appropriate", December 2011 - 30 years ago. I can still hear Dad roaring with laughter at M&W on Sunday evenings when I was growing up, and I spent much of my formative years developing my own sense of humour, comedy and timing by learning from people like Eric Morecombe and Tommy Cooper, and then trying to make my Father laugh. If Eric Morecombe was my Hero of Comedy, Dad was my arbiter of what worked and what didn't work. 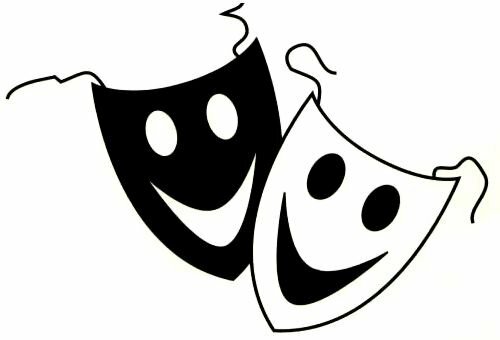 When I was an actor, I loved doing comedy and have fond memories of performing in Alan Aykbourn plays at Dundee Rep and with John Inman in Eastbourne. I always got work at Christmas time, in Panto, usually playing some kind of comedy foil - Broker's Man in "Cinderella", Mate to the bossy Captain in "Jack and the Beanstalk" (#1), "Simple Simon' in "Jack and the Beanstalk" (#2) and Pong the Chinese Policeman in "Alladin" (the panto where I met my future wife, Mandy, back in 1982). It's a fine line tho', between being funny (in my view, authentic) and being a clown (artifice). On that basis, I rarely enjoy slapstick or comedy based around stupidity (Sorry, Miranda), but I do admit to getting the occasional giggle out of "You've Been Framed" (something to do with schadenfreude I reckon). So, back to social media, professional networking, the difference between humour and sarcasm and the effectiveness /appropriateness of both in those arenas. What works well as a throw-away remark or light-hearted comment in a face to face environment relies on everyone being 'in on the joke' by being present and being able to pick up on all the cues - verbal and non-verbal - which make up the context. That applies as much in the theatre as it does in the boardroom or the classroom. It also explains why stand-up comedy works, because the audience can both see and hear the comedian, and can appreciate their physicality as well as the story or joke itself. Similarly, good radio humour is 'good' because it is unambiguous in its intent, its delivery and its clarity - written to ensure that the lack of visual cues does not detract from its impact. And then we come to humour in the online world. This, I would suggest, is an altogether more difficult and treacherous beast, more likely to bite the unwary and careless. Even more so, if attempted within the constraints of the Twitter 140-character limit. From my observations, some people don't quite get that. Some of the people I follow on Twitter are professional comedians or commentators, and they post humorous tweets which are great examples of the art of the online joke - I'm thinking here of people like David Schneider (@davidschneider) and Dara O'Briain (@daraobriain) - and I enjoy a bit of banter with my Personal Learning Network (PLN) as much as the next person. However, my own self-preservatory instincts mean that I frequently self-censor online what I would normally risk' in the room' or f2f precisely because I don't think it would translate or it would be misconstrued, misunderstood or misinterpreted. The immediacy and ease with which one can dash off a witty response to someone else's tweet or comment has tripped up many people, and - particularly where the professional and the personal learning networks meet or indeed overlap - could mean the end of some beautiful friendships. Sarcasm, "the last resort of the imaginatively bankrupt" (Cassandra Clare - @cassieclare), in an attempt to be funny or to make a point, does not play well in this space either, coming across - in my opinion - as judgemental and smug, whether delivered 'dead pan' or with an implied wink (and, by the way, don't you just hate people who wink?). Something to be avoided, I'd suggest. By all means, tell us a funny story, but let there be either a good punchline (surprise me) or have a good learning point to make that we can benefit from (connect). I thank you. Go on, give us a laugh! I'm sitting at your end of the continuum on this I think Niall. I wonder/worry about being misinterpreted too. Humour for me isn't just in the words, it's in the tone of voice and the physicality of its delivery. And its part of a relationship too. There are some people I can be funny with and others who just don't ignite my funny spark. When all the factors, words, tone and physicality, are combined the humour lands effectively and you can perhaps 'manage' the reaction a little more effectively. Really enjoyed your post, thank you! Although I don't know you that well yet, I'd say HMS Smug Git is still firmly in dock and will, in all likelihood, stay there! Thanks Mike - Care to share that thinking?